FOURSQUARE OFTEN GETS dismissed by pundits who think it's just a silly game. When that happens, I think those critics have never seen the in-app Foursquare community. I first realised Foursquare could provide me more than a cute little badge when I rolled over in a Portland Hotel because of some loud music outside. I happened to glance at Foursquare and it told me the name of the place. 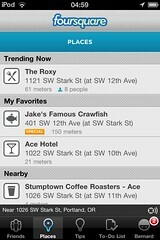 In fact, the club was trending on Foursquare at the time. And inside venue on Foursquare I found dozens of in-app comments, tips and sometimes personal remarks that showed me the Foursquare app was connecting people with people often as much as it was connecting people with venues. That's happening here in Ireland as well. I think it's remarkable that a small company like Foursquare can continue iterating, carving out a location-based system that holds true to the spirit that Dennis Crowley set out several years ago. Perhaps Crowley knew how reliable the GPS sensors would be on today's mobile phone handsets. Those sensors tie right into Foursquare's geolocation platform. They ensure places can be specifically identified and the Foursquare app helps people connect with place as a means of establishing an identity online. And that is why Foursquare is so successful. People want to be identified with place. People want to share expertise about places or about products and service at places. Foursquare facilitates this in a very elegant way. I COULD EASILY make a five-minute video of food I miss from Amish country where I grew up. 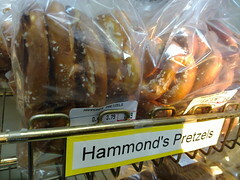 I plan to do that sometime to offer a way to rewind with comfort food like Hammond's pretzels, Utz potato chips, Tastykakes, Lebanon bologna, oyster stew, soft shell crab sandwiches, pretzel ice cream cones and crispy baked corn. In the meantime, I have only one snapshot of pretzels to share over-the-air using my time-worn Nokia E90 connected to AT&T mail2blog Typepad services in Pine View Acres. After I upload the shot, we're headed to Darrenkamp's to forage for more essential food. WHILE AWAY FOR THE WEEKEND, I followed Gina Trapani's advice and fired up Foursquare when 150 km from home. It told me a lot things I knew and laid out the names of shops that I'd spent good money in before. But the orange highlight that caught my eye came from the D Hotel, offering coffee for its mayor (at right). I'm far from being a mayor, although I think I put that venue on Foursquare's map. Whatever--I ended up in the foyer of the D Hotel, read a paper for free and bought a pot of coffee for a light breakfast. Then I started tweeting about coffee along the Irish motorway and got a few suggestions worth road-testing on Foursquare an hour south of Drogheda. Sent mail2blog using my Nokia E90 and O2-3G Typepad service in Scotch Hall, Drogheda, Ireland.